A Proper Natural: Natural hair care products. To help with growth and breakage of hair. To relieve itchiness and dandruff. Just all around natural hair products. A Proper Natural Sealing Butter is made to promote healthy hair growth by eliminating harmful chemicals. BFabric Art: Handcrafted products using fine fabrics, including bags, change purses, bookmarks, key fobs, scarves, tops and accessories using African print fabrics. Blessings Extraordinaire: Full service Christian business located in Lake Ridge, Virginia. Designed to be a Blessing, our line of gifts and services encourage relational fellowship and gift-giving opportunities and includes mugs, a variety of drinkware, fashion jewelry, totes, Sunday school novelties, books, apparel, wall frames, plaques, clocks, and much more, all from trusted brands. Corsages, Boutonnieres, Gift Bags/Baskets also available. Exclusively…Poinsetta! : Handcrafted, Afro-centric Dolls honoring African-American woman; Doll candy jars; Afro-centric Greeting cards; handcrafted leather jewelry. Franks & Things: Soap, shea butter, t shirts, Michelle Obama bags. From One Hand to Another (FOHTA): Frame calligraphy prints and posters. From One Hand To Another – FOHTA is a small unique calligraphy business striving to serve each Fohtatarian in spiritual gift-giving. Joan Mulholland: Book and DVD sales to benefit the Joan Trumpauer Mulholland Foundation. Max’s Mixtures Candles and Soap: Handcrafted soaps and candles made in Arlington, VA.
Noggin Topper Hair Bows: Colorful, multi-cultural and reasonably-priced hair bows, novelty hair clips, hair bands, ponytail streamers, and bow ties. Paparazzi by Toni: $5 jewelry (excluding signature collection). Perfume Chicks 2: Hand whipped shea butters, body washes, soaps and oils along with some all natural healing creams and oils. Real Time Pain Relief: Topical Analgesic, foot cream, sports cream, skin cream. 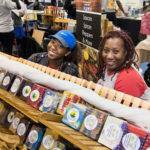 Remedies from Nature: Herbal and aromatherapy products; personal care products; hand-crafted soaps and shea butter lotions. All products are designed to help with treating the whole person. Products will include soaps; lotions; tinctures; balms; salves; hair care products; products for hands, feet and face. Roxanne’s ARTiques: Ceramic Art Coasters with Jazz Artists and international artifacts. 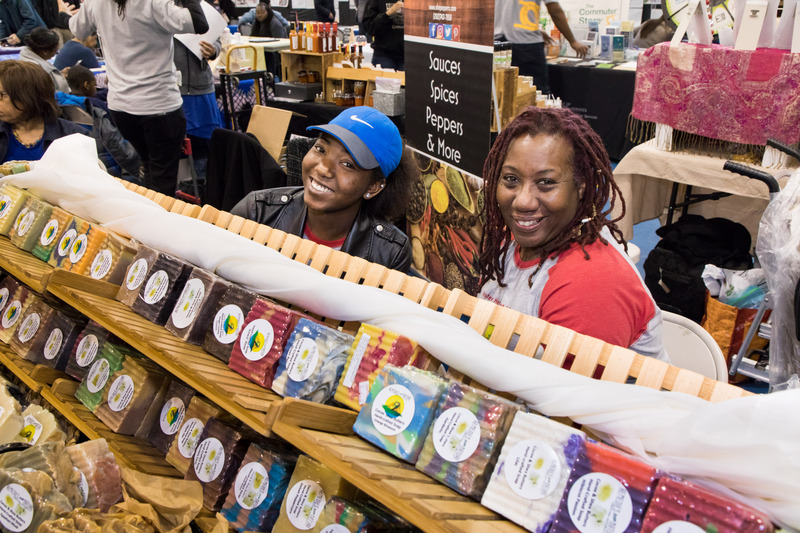 She Peppers LLC: Artisan, hand crafted sauce and spice shop. Products include hot sauces, seasoning blends, infused products and teas. SimoneTM: Children’s book “Simone Visits the Museum” (to be signed by author that will be present) and children’s apparel. Watkins Products: Flavors, spices, soups, liniments, air fresheners, hand soap. Wreaths & More by Sandy: Floral arrangements sized down for home bound persons, where size is a issue and thinking of you gifts. Lighted glass blocks and wine bottles. Gift baskets, wreaths “floating teacups”, jewelry sets. 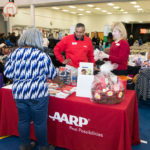 AARP: AARP is the nation’s largest nonprofit, nonpartisan organization dedicated to empowering Americans 50 and older to choosehow they live as they age. Alfonso Lopez for Delegate: Alfonso Lopez is running for re-election to the Virginia House of Delegates. Alzheimer’s Association: The Alzheimer’s Association is the leading voluntary health organization in Alzheimer’s care, support and research. Their mission is to eliminate Alzheimer’s disease. Arlington Addiction Recovery Initiative: Arlington Addiction Recovery Initiative is Arlington’s Opioid and other addictions taskforce which is comprised of stakeholders from across the county. Arlington CERT: A program of Arlington Emergency Management, the Arlington Community Emergency Response Team (ArlCERT) is a volunteer group trained to save lives and reduce injuries in Arlington in the a major disaster when activated by the County. Arlington County Car-Free Diet: Program to educate (in a fun way!) County residents and visitors to lessen the use of their personal cars. By lessening the use of single occupancy cars, we encourage County residents and visitors to consider alternative modes of transportation such as:ꞏ Metrorailꞏ Bus (ART and Metrobus)ꞏCapital Bike Shareꞏ Vanpools, Carpoolsꞏ Personal bicyclesꞏ Walkingꞏ Telework Adults and children can play our Transportation Trivia. Arlington County Department of Parks and Recreation: Information about the Jennie Dean Park redevelopment project. Arlington County Department of Parks and Recreation – Nature Centers: Information about the Gulf Branch and Long Branch Nature Centers and a special appearance by critters who live at the centers. Arlington County DES-Solid Waste Bureau: Solid Waste Bureau’s Mission is to make Arlington a more atractive and sustainable place to live, work and play for current and future generations by preserving natural resources, recovering resources and providing community cleanliness services. They will bring a basketball double shot style game for attendees to play. Arlington County Police/Fire Department: ACPD Community Outreach Team and members of the Arlington County Fire Department. Arlington Food Assistance Center: Arlington County’s largest food pantry, serving 2300 Arlington families every week with supplemental groceries. Arlington Housing Division: The HD offers services and programs to ensure Arlington remains a vibrant community with individuals from all backgrounds. A comprehensive approach to meeting housing needs is vital for economic sustainability, diversity and quality of life. Arlington Independent Media: Arlington Independent Media provides the community with media production training courses, access to professional equipment and facilities, and distribution platforms including a cable tv station, an FM radio station and two media rich websites. 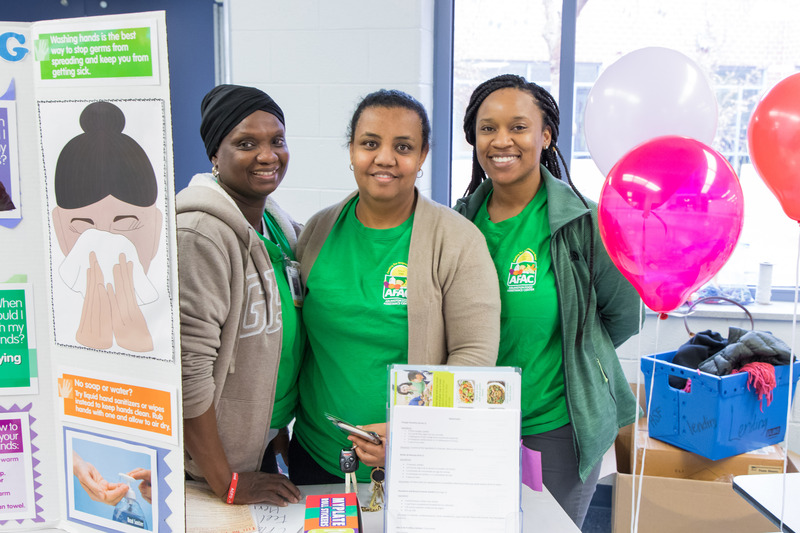 Arlington Partnership for Children, Youth and Families: Community lead organization that hosts drug and alcohol prevention events, parenting workshops, suicide prevention, and much more. 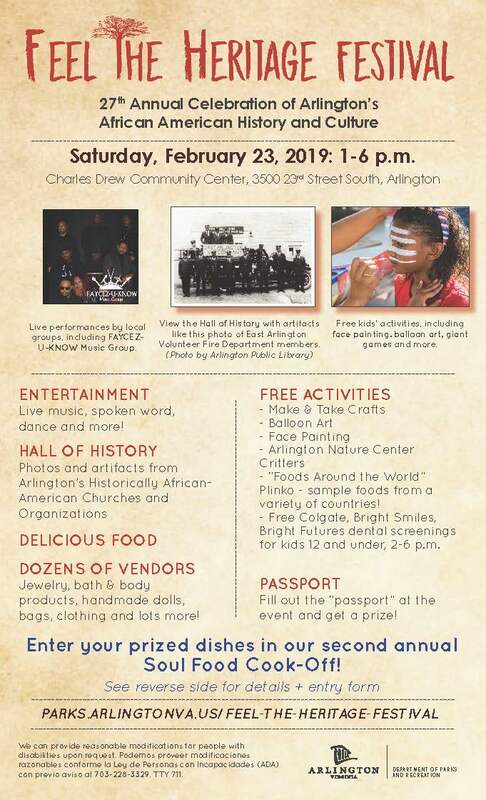 Arlington Public Art: Arlington Public Art in partnership with Historic Preservation has brought book artist and papermaker Amos Kennedy to honor and commemorate the civil rights movement in Arlington. Amos Kennedy will be conducting a letterpress demo during Feel the Heritage. Arlington Public Library: Arlington Public Library is the heart of a thoughtful, inclusive and dynamic community where people and ideas connect. They champion the power of stories, information and ideas. They create space for culture and connection. Arlington Regional Master Naturalists: The Arlington Chapter of the Virginia Master Naturalists, a non-profit group of certified volunteer educators, citizens, scientists and stewards helping to conserve and manage natural resources and public lands in Virginia. Capital Caring: Capital Caring provides palliative care and hospice care to those suffering with an advanced illness, as well as bereavement counseling to individuals who have suffered a loss. CPHD – Neighborhood Services Division: Project information and display for Nauck Town Square. First Home Care: First Home Care is a foster care agency providing services that support, train, advise, educate, nurture and treat children who are in out of home placements. JD Spain for Delegate: Political candidate. MentorPrize: MentorPrize recruits mentors and place them with local mentoring programs in the greater D.C. area that serve a wide range of constituents — from homeless kids to teenage parents to first generation college students. Moms Demand Action for Gun Sense in America: Non-partisan, grassroots volunteer organization dedicated to ending gun violence. Priorities include the safe storage of firearms in the home and passing a universal background check on all firearm sales law. Parisa Tafti for Commonwealth’s Attorney: Parisa has worked in the criminal justice system for nearly 20 years. She will fight to create a fairer, more humane, and more effective criminal justice system, that makes us safer and reflects our values. Vote June 11, 2019. Sierra Club Virginia Chapter: The Virginia Chapter of the national Sierra Club, the nation’s largest and most influential grassroots environmental organization. Theo Stamos for Commonwealth’s Attorney: For more than 30 years Theo hadbeen on the front lines of the criminal justice system, the last 7 years as Commonwealth’s Attorney. Theo seems re-election to her third term with a primary date of June 11th, 2019. 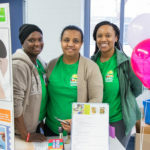 Together Program: Together is a free evidence-informed program that offers relationship and financial education, connection to community resource, and employment services to couples residing in Northern Virginia, Montgomery County, and Prince George’s County.The program is led by Professors and graduate students from Virginia Tech University and The University of Maryland, College Park. Virginia Relay: Virginia Relay enables people who are Deaf, Hard of Hearing, DeafBlind, or have difficulty speaking to communicate by TTY (text telephone) or another assistive telephone device with anyone who uses a standard phone. WalkArlington and BikeArlington: WalkArlington and BikeArlington will share community resources for getting started and enjoying walking and biking. The programs will also have interactive information about notable achievements in African American history, past and present, related to walking and biking. Bar-B-Que at its Best: Jerk chicken and rice, ribs sandwich, ribs half slab or whole slab, wings, mac n cheese, cabbage, baked beans, coleslaw, drinks. 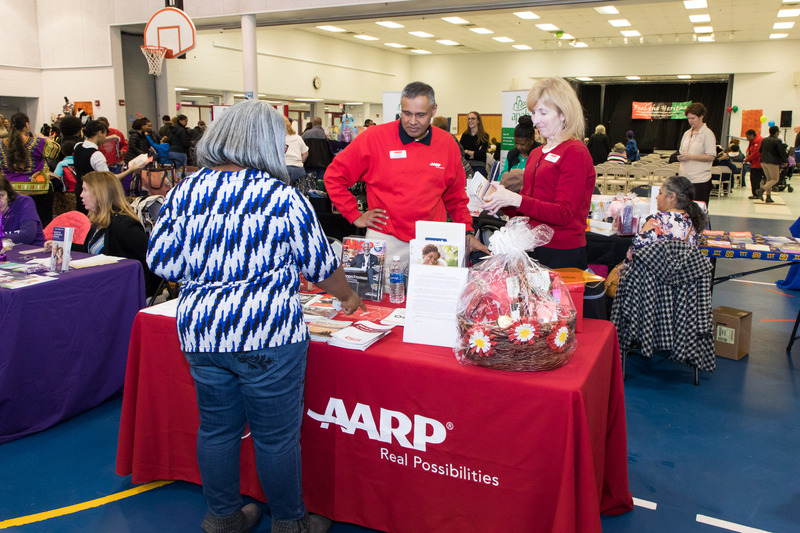 Nauck Civic Association: Baked goods – cookies, cupcakes, cakes, banana pudding. Rocklands Barbeque and Grilling Company: Chopped pork or pulled chicken sandwiches, beef brisket sandwiches, sides: macaroni and cheese, baked beans, coleslaw, potato salad, cornbread or chips, soda, bottled water. Vendor applications are no longer being accepted as of January 31. Booth spaces have sold out. To be added to the wait list, email lbarragan@arlingtonva.us.